A Thread Facelift, also known as a “lunchtime lift,” is a safe, convenient procedure that reduces sagging around the cheeks and jawline. Special, clear threads are used to inconspicuously re-position and hold skin and facial tissue in place. Noticeable results can be seen almost immediately, with less risk and inconvenience than more conventional procedures. Often, a Tread Facelift is combined with injectable fillers or fat to enhance results. Candidates for a thread facelift are usually in their 30s to 60s and have sagging in their face or neck. 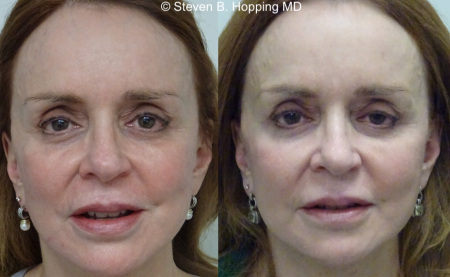 This procedure cannot offer the same results as a full facelift but is a good option for a subtler rejuvenation. 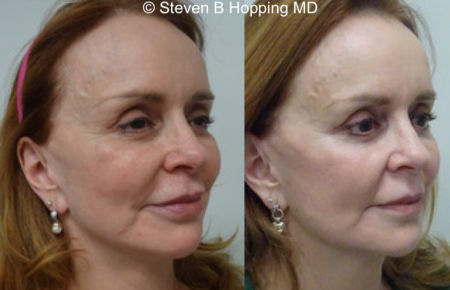 For those who have very loose skin or significant drooping facial areas, Dr. Hopping recommends the Laser S-facelift procedure. The procedure involves inserting threads into the skin, which are then pulled tight, lifting the skin and underlying muscle to create a tighter, smoother complexion. Dr. Hopping is meticulous about preparing the skin and applying numbing medication. Before a thread is inserted, he makes markings to determine the proper point of entry, direction and exit point. He then inserts thin threads into the skin, which are pulled tight lifting the skin and underlying muscle to create a tighter, smoother complexion. Attached to these threads are tiny barbs that grab hold of the skin from the under surface and lift to reposition the skin for a more youthful look. As the threads dissolve naturally, the skin starts to produce more collagen and elastin, which gives a longer-lasting result. This minimally invasive procedure is done in our office under local anesthesia and takes between 30 to 60 minutes. Slight dimpling, bruising, and swelling are normal within the first few days, but improve rapidly as the sutures are absorbed. There’s minimal downtime and patients can go back to their normal activities within two days. It usually takes 7 to 10 days for the skin to fully recover. The regenerative action is gradual and subtle, with results improving over the next few months. You look refreshed and rejuvenated, while keeping all your natural expressions. The results are expected to last around 12 to 18 months. Results vary from patient to patient. Find out if you could benefit from this procedure. Schedule your consultation with Dr. Hopping today.